PHP and MySQL make up what must be the best combination for data-driven Web sites on the planet. If you are using PHP and MySQL on your website and would like to integrate SMS messaging into your application, follow the steps below. The following steps work on Linux, Soliaris, MacOSX and Windows platforms. In this example we assume that you have an Apache webserver with PHP support configured with a MySQL database server on a Linux machine. You would like send SMS messages with the Ozeki Sms Server, which is installed on another PC running Microsoft Windows. In this case all the SMS sending and receiving tasks can be done by using MySQL SQL statements in your PHP script. All you have to do is create the appropriate database tables, install a MyODBC driver on the Windows PC running the Ozeki SMS Engine and make some configuration. The MyODBC driver will enable the OZEKI SMS Server to insert the incoming SMS messages into the remote database and check this database periodically for outgoing messages. Log in to your MySQL database server and attach to the database you are using. After you have created the database table, don't forget to create a user with appropriate privileges. This user has to be able to log in to the database from the Windows PC and should have privileges for selecting and inserting records into the newly created tables. Click on User DSN Tab (by default it is on that) abd click Add as shown in the figure above. Scroll down and select the MySQL ODBC Driver. In the MySQL ODBC driver configuration enter the details as seen in the figure (in the database name enter your database name) and after you fill in all the proper fields click on the Test Data Source to check if you have properly configured your Database settings. Install the OZEKI SMS Server. You can read the installation instructions at the installation manual. 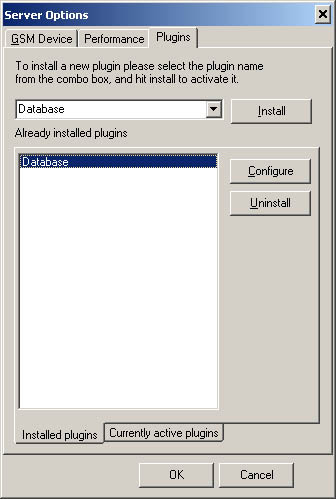 Select Database from the drop down and hit the Install button. After the plugin is activated you can configure it. Configure the database connection in Ozeki SMS You can do this by clicking on the configure button at the plugin activation form. 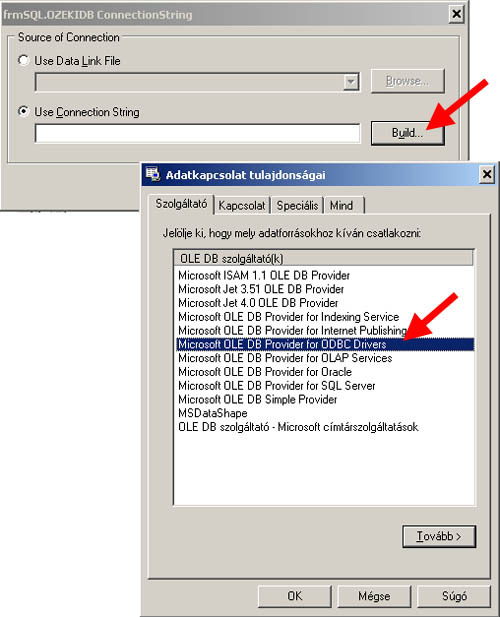 On the Database Settings form, clik on the Build database connection button. This will bring up the connection selection dialog. After this is done, make sure you test the connection by clicking on the Test Connection button located in the lower right hand corner of the form. Press OK to finalize your settings. Create a PHP script that will be able to send and receive SMS messages. This can be done by issuing SQL queries to the MySQL database. The OZEKI SMS server will check the ozekismsout database table periodically for outgoing SMS messages and place the incoming SMS messages into the ozekismsin database table. When the appropriate scripts are created you are ready to send and receive sms messages from your webpages. The great thing about this approach is that it is very convenient to use and it can survive network errors. 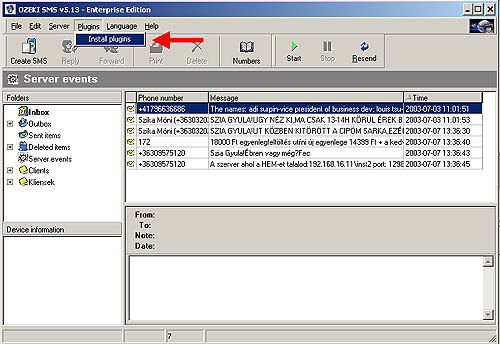 If, for example, the network connection between the database server and the SMS server failes for a period of time, all the incoming and ougoing messages are saved. When the connection resumes they are sent or inserted to the database. You can monitor ODBC events with the help of the event monitor window of the Ozeki Sms Server.